The U.S. military says an American service member has died in a bomb blast in Afghanistan, making August the deadliest month of the eight-year war for U.S. forces. 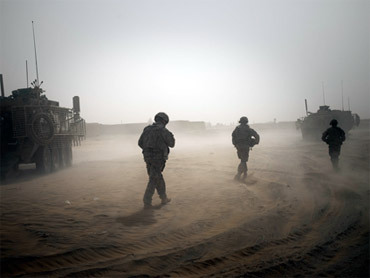 NATO forces say the service member's vehicle struck a roadside bomb in eastern Afghanistan on Friday. A U.S. forces spokeswoman confirmed the nationality but did not provide further details. The death brings to 45 the number of U.S. troops who have died in Afghanistan this month, meaning August has surpassed July as the deadliest of the conflict. More than 60,000 U.S. troops are now in the country - a record number - to combat rising insurgent violence. Meanwhile, Afghanistan President Hamid Karzai angrily accused the U.S. of pushing for a runoff in the Afghan presidential election during a heated meeting with the special envoy to the region, officials familiar with the encounter said Friday. The reported exchange was another sign of strains between the U.S. and Afghan authorities. An Afghan lawmaker accused the U.S. of violating international and Islamic law by firing on a clinic where a wounded Taliban commander had taken refuge. U.S. officials said they attacked only after taking gunfire and determining there were no civilians inside. The verbal exchange occurred the day after the Aug. 20 vote during a meeting in Kabul between Karzai and U.S. special envoy Richard Holbrooke, according to two officials who were briefed about the meeting. They spoke on condition of anonymity because of the sensitivity of the information. They said Karzai assured Holbrooke that he would accept the election results but bristled when the envoy asked if he would also agree to a runoff if none of the 36 candidates won over 50 per cent, the officials said. An angry Karzai accused the U.S. of pushing the idea of a second round even before all the votes had been counted and he would accept the election commission's tabulation as long as they reflected the facts. He did not elaborate. Final results are due next month but preliminary figures released this week show Karzai leading former Foreign Minister Abdullah Abdullah and 34 other candidates but falling short of the 50 per cent mark needed to avoid a runoff. The U.S. Embassy confirmed the Aug. 21 meeting and said the two discussed the election but would not go into details. "There was no shouting and no one stormed out," said Caitlin Hayden, an embassy spokeswoman. She noted that Holbrooke and Karzai met again a few days later. "Whether there is a runoff is an issue for the Afghan electoral bodies to determine," she added. Karzai's office also confirmed the meeting but gave no further details. "We are not discussing the contents of discussions that take place between the president and a foreign representative," said Karzai spokesman Humayun Hamidzada. Strains in U.S.-Afghan relations emerged after President Barack Obama's administration took office this year. Karzai enjoyed close ties with the Bush administration, which helped propel him to power after the collapse of the Taliban government in the 2001 U.S.-led invasion. U.S. officials have accused Karzai of weak leadership in the face of the resurgent Taliban, corruption and the flourishing drug trade. However, the U.S. has insisted it is neutral in the election and will work with whoever wins. In another sign of strain, The New York Times reported this week that the Obama administration is alarmed at the prospect that Karzai's running mate, Mohammad Qasim Fahim, may be linked to the drug trade. Quoting an unidentified administration official, the newspaper said that if Fahim becomes vice-president, the U.S. would likely consider imposing sanctions such as refusing him a U.S. visa or going after his personal finances. A U.S. official in Washington confirmed the essence of the report, saying there were "a number of individuals" whom the U.S. would not like to see in a future Afghan government. The official said the U.S. had conveyed those sentiments to the Afghan government. He spoke on condition of anonymity due to the sensitivity of the subject. Relations between the Americans and Afghans have also been strained by the U.S. policy of detaining suspected insurgents without charge and killing civilians in military operations. The new U.S. commander, Gen. Stanley McChrystal, has issued new orders sharply limiting use of airstrikes and encouraging U.S. troops to protect civilians.